Costume Designer. Nationality: American. Born: Oakland, California, 5 June 1902. Education: Attended the University of California, Berkeley. Career: Vaudeville and stock actor; designed costumes for touring vaudeville chorus; 1926–40—designer for FBO (later RKO); 1940–47—freelance designer; 1947–66—designer for MGM; also designer for Broadway shows and Metropolitan Opera productions. Award: Academy Award for An American in Paris , 1951. Died: 8 March 1982. The Velvet Light Trap (Madison, Wisconsin), Spring 1978. Films in Review (New York), January 1973, additions in August-September 1973 and December 1974. American Classic Screen (Shawnee Mission, Kansas), July-August 1982. American Classic Screen (Shawnee Mission, Kansas), September-October 1982. Walter Plunkett lacked the knack of high couture. He could not compete in the world of super-rich chic with Paris-trained Adrian or Travis Banton. Instead, Plunkett excelled in designing glorious garments of days gone by. With the fervor of a 19th-century archeologist, Plunkett worked to make his name virtually synonymous with the "period" picture. Originally an actor, Plunkett prepared as if trained by Stanislavsky. Endowing his costumes with presence and character, even the humblest handmade, as seen in Little Women , was seamed with integrity. Plunkett worked especially well with Katharine Hepburn at RKO because both artists aimed for veracity in character and era. Because Plunkett's dresses were assuredly accurate even in the way in which they were made, Hepburn rehearsed in costume to achieve proper movement. She insisted on learning how to maneuver hoops and how to turn her head in stiffly starched ruffs as if such movements were natural to her in order to insure that costume and characterization became one. Plunkett also was responsible for the Fred Astaire-Ginger Rogers look. Their dance attire, integral to that "carefree" image, depended on Plunkett's elegant lines, as they inhibited or released areas of mobility. Astaire, of course, insisted on comfort and optimum freedom. Rogers preferred glamour and eye-catching gimmicks. 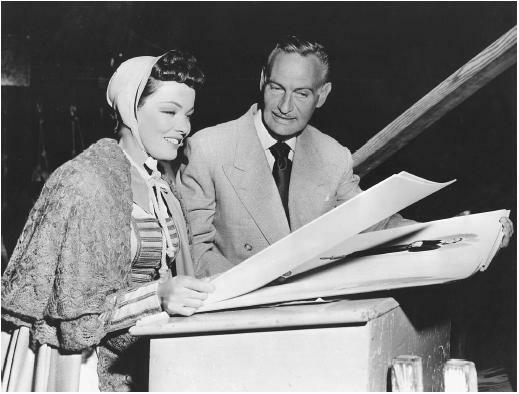 For David Selznick's Gone with the Wind , Plunkett chronicled the fall and rebirth of the Deep South through Scarlett O'Hara's well-researched wardrobe, which marked her passage from selfish innocence to hardened maturity. For example, the famous "dining-room curtains" dress, ornamented with jaunty tassels and a smart, one-shoulder cape, illustrated Scarlett's spunky calculation in the face of adversity. As one of the first technicolor movies, Gone with the Wind dazzled with picture-postcard color. Plunkett had already worked within the limited range of the two-color process at RKO, but now he filled the screen with sapphire, dusty rose, antique blue, claret red, and infinite shades of green. Still remembered today, the gowns of this film reflected an emerging post-Depression fashion trend. However, the Second World War aborted the cinch waist and wide, fabric-consuming skirt symbolic of prosperity and the romantic ideal of womanhood; only after the war were they resurrected in Dior's postwar "New Look." Plunkett's later pictures echoed some interesting modern trends. His American in Paris sequence depicted the artists' ball in abstract blacks and whites, more like the flamboyant visions of Adrian than traditional Plunkett. They splashed the screen abstractly as if flung from Jackson Pollock's paint brush. Throughout the 1950s, Plunkett continued his successful "period" creations. At the same time, he began to mimic the very popular culture that he and other designers had created. His mannerish garb for Judy Garland's Summer Stock , for example, recalls Travis Banton's collaborations with Marlene Dietrich. Plunkett's greatest homage to the silver screen however was in Singin' in the Rain . Exaggerated American motifs paid glorious tribute to those brash Hollywood musicals of his earlier days in the business.